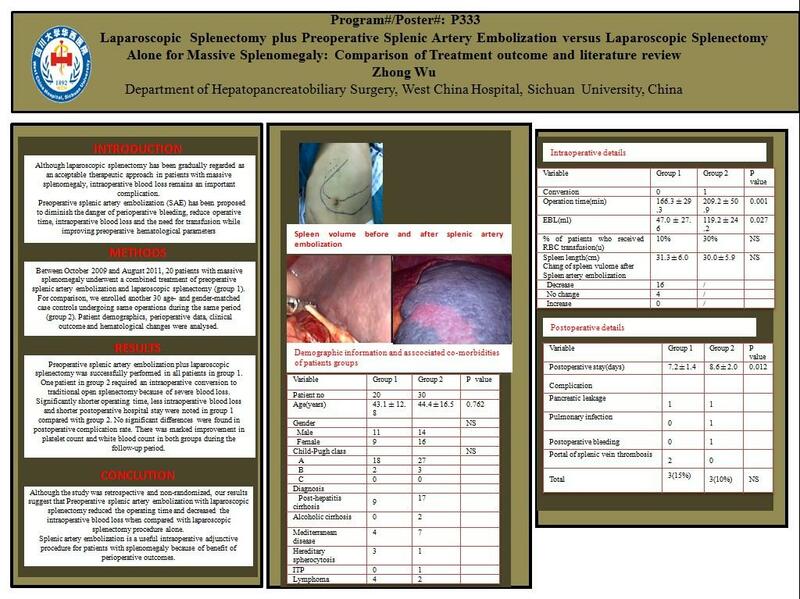 Introduction: Although laparoscopic splenectomy has been gradually regarded as an acceptable therapeutic approach in patients with massive splenomegaly, intraoperative blood loss remains an important complication. In an effect to reduce this risk, we evaluate the clinical outcome of a combined treatment of preoperative splenic artery embolization plus laparoscopic splenectomy. Methods:Between October 2009 and August 2011, 20 patients with massive splenomegaly underwent a combined treatment of preoperative splenic artery embolization and laparoscopic splenectomy (group 1). For comparison, we enrolled another 30 age- and gender-matched case controls undergoing same operations during the same period (group 2). Patient demographics, perioperative data, clinical outcome and hematological changes were analysed. Results:Preoperative splenic artery embolization plus laparoscopic splenectomy was successfully performed in all patients in group 1. One patient in group 2 required an intraoperative conversion to traditional open splenectomy because of severe blood loss. Significantly shorter operating time, less intraoperative blood loss and shorter postoperative hospital stay were noted in group 1 compared with group 2. No significant differences were found in postoperative complication rate. There was marked improvement in platelet count and white blood count in both groups during the follow-up period. Conclusion:Preoperative splenic artery embolization with laparoscopic splenectomy reduced the operating time and decreased the intraoperative blood loss when compared with laparoscopic splenectomy procedure alone. Splenic artery embolization is a useful intraoperative adjunctive procedure for patients with splenomegaly because of benefit of perioperative outcomes.